PRODUCT DESCRIPTION: Aerosol with pyrethrin as the active ingredient. It is easy to use and will kill many insects. It has a slight odor. TARGET PESTS: Angoumois Grain Moths, Ants, Bed Bugs, Booklice, Carpet Beetles, Centipedes, Chocolate Moths, Cigarette Beetles, Clothes Moths, Clover Mites, Cluster Flies, Cockroaches, Confused Flour Beetles, Crickets, Drugstore Beetles, Fleas, Flies, Fruit Flies, Gnats, Grain Mites, Granary Weevils, Horn Flies, House Flies, Indianmeal Moths, Mediterranean Flour Moths, Millipedes, Mosquitoes, Mud Daubers, Red Flour Beetles, Rice Weevils, Saw- toothed Grain Beetles, Silverfish, Small Flying Moths, Sowbugs, Spiders, Stable Flies, Ticks and Wasps. WHERE TO USE IT: Inside, outside and pretty much anywhere target pests are active. RATE OF APPLICATION: The application rate depends on the surfaces being treated. When using the crack and crevice tip, be sure to get enough applied so the void is penetrated. If surface or spot treating, just a light mist is will do the job. Does the PT-565 PLUS XLO 20 OZ CAN come routinely with the crack and crevice tip? Or is it separately purchased? We always include both nozzles with every order we ship. I have birds – will the products that get rid of Booklice harm my birds? When used properly, the listed products for booklice won't be a safety issue for your birds. The key to keeping them safe is simple. Basically you'll want them out of the rooms you treat and only after the rooms are allowed to dry and aerate should you bring the birds back. This will normally take 1-2 hours. In fact we have in depth safety video's on every product page and you should definitely watch them. These video's do a great job of covering all the details one should follow regarding the safe and proper use of our products and I'm certain they will answer any questions you might have so you can proceed with treating with confidence. The one on aerosol above is worth watching and if you get any concentrate, we have another one you'll want to see as well. And as always, just shoot us an email or call should you have any remaining questions. Purchased for fungus gnats – works great! Will buy again. Had book mites falling from fixture in bathroom. Found the fixture in the attic and sprayed around and in all cracks. No leaks or moisture found. Humidity is high so that is the culprit. How well does this work on roaches? Combined with the liquid Phantom, you'll get great results. How well does this product work on book lice and carpet beetles? I also have small children in my home. Will this product be harmful to them? Thank you. If you read our article on booklice, you'll learn the PT-565 will kill them quickly. Certainly within a minute or two after its applied. And for the most part, this will be true for carpet beetles too so it can be used. But the pyrethrin will be short lived meaning it will break down quickly and be gone within 30-60 minutes so it doesn't provide residual or "lasting" action. This means you'd need to use it daily if you want to achieve long lasting control. And failure to treat daily for a few weeks would allow the pest to survive. With that being said, you'll be better served using the PT-Microcare listed in our booklice article. It too uses pyrethrin but because its micro encapsulated, the treatment will last a few weeks and meaning it will keep killing via the slow release action of the capsules. Now for carpet beetles, the best aerosol option would no doubt be the Bedlam Plus (featured in our article too). It contains both an adulticide and a growth regulator which is important for long term control of this pest. PT-565 will definitely help. And if the problem is an isolated case, it will fix it for good. Now what we mean by isolated is that as long as the gnats are not reproducing in the home, treating 2-3 times a day for a few days should kill them all. Use the 565 like hair spray in any room with activity. Within 15 minutes the one you see should be dead. And if they return later that day, treat again. Eventually they should disappear. PT-565 can be safely used as frequently as you want. Just keep the kids and pets out of the room you treat for 10-15 minutes after spraying but after that they can come back and use the room like normal. Now if you still have activity after 5-7 days, it would mean they must be nesting in the home and for this kind of problem, I would recommend going with an Aerosol Machine and some Metered Insecticide. Basically this uses the same active as the 565. But instead of you doing the treating, the machine does it for you. They're set to go off every 15 minutes and one machine can handle a room up to 400 sq/ft. So all you need to do is to add two D cell batteries, a can of Metered Insecticide (which will last for 30 days), turn it on and set it on a shelf. From there it will do all the work for you and by treating around the clock, it will eventually kill them all and prevent reproduction. I have a small dog Chihuahua size. Can I spray this in my apartment, stay in the bedroom with my dog. Wait 15 minutes, spray my bedroom and wait in the living room with the windows open? Would this be ok for the dog and me :)? Also I think I have phorid flies, how effective would this be with the drain gel? Treating rooms and staying in another room 15 minutes with your pet would be a fine way to insure no one is bothered by the spray. In fact some people can be mildly irritated by pyrethrin but it poses little to no risk. But your plan is a good one for space treating any room. As for the phorid flies down the drain; get the Survivors and PT-221 listed in our article. Use the Survivors once a week and the PT-221 any other night as needed. I play golf and some how have come in contact with thrips and they're in my car. What is the best solution to take care of and get rid of the problem? As you'll see from the link above, both are aerosols. 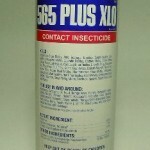 The first option is the manually controllable PT-565 spray can. This fast acting pyrethrin based aerosol is good for use in small areas like an auto. It will quickly kill all active stages of any flying pest but it won't last. Like any pyrethrin, it will be gone in 15-30 minutes. That means as new thrips come into the area (like hatching adults), the problem will develop all over again. Now if you go with the aerosol machine, you'd want to turn it off when the car is in use. But you would want to keep it on overnight and during the day when the auto is sitting for any length of time. I have small but persistent infestation of fruit flies. Will PT-565 work with these tiny pests? It can. As explained in our Fruit Fly article, it will kill the adult stage which in turn can prevent new eggs from being laid. Now for a more "permanent" space spray, consider getting the Aerosol Machine equipped with Clear Zone refills. This works like the 565 but instead of relying on you to do the treating, it goes off automatically every 15 minutes so you never miss treating.